View of Daer reservoir in the Daer Valley. And we’re looking for help! We’ve quickly leapt forward 20 miles and 5,000 years or so from Paleolithic Howburn to Mesolithic Daer. Our next Biggar! Dig is in the Daer Valley. Our clear felled forest walking has paid off with a potentially huge mesolithic area to be explored. The forest walking at Daer has opened up new, previously unknown, areas of Mesolithic and Later Neolithic sites. Mainly following the contour of the lower hills around the Daer Valley – we’ve still to walk the tops of the hills where we hope to find more evidence of them. So far, in this area, Bronze Age house sites elude us, but you never know. How do we know we’ve got such an expanse of occupation? 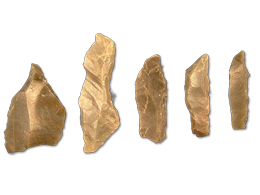 Some of the finds from the fieldwalking include microliths – both flint and chert, cores, scrapers, pottery, fireplaces, cairns (potentially burial) and burnt mounds. 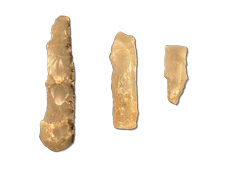 These have been exposed in the trench digging process for the expansion of the tree plantation. On Sunday we started the excavation in one area of lithic concentration. We had a great start finding several microliths and a possible piercer from less than 2 square metres (pictured). This dig will take some time and we are going to need lots of help so if you would like to come along and give us a hand, please use the contact form to get all the details. It would be great to get as many volunteers as possible for this excavation and also to continue walking the area. The walking can be hard going as it’s mainly up and down hills, but it’s worth the effort to increase the potential of more Mesolithic and Late Neolithic sites. 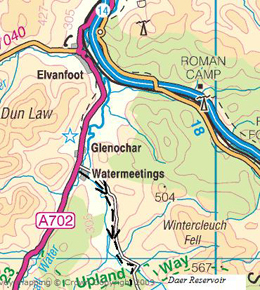 The sites for excavation are a short walk from the forestry access road. We will be working on this site from Sunday 30 May for about 2 months (depending on the number of volunteers we get) – working Saturdays and Sundays. We will need people for fieldwalking and excavation so if you are interested, use our contact form to get in touch and let us know what you would like to volunteer for. We will continue to keep the website up to date with what we find and how we are getting on and how the dig is progressing. So keep checking back with us and keep on top of the finds and progress. We have excavated at Daer Valley before and you can read more about that and the reservoir itself in the Clydesdale section of the current projects. 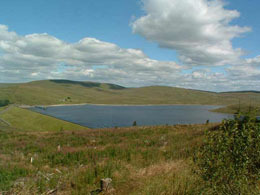 The site is situated within the forestry area of the Daer Valley. The road access is basic and a bit rough, there are locked gates to deter unauthorised access. It’s essential that you contact us to let us know if you are planning on coming along. This helps with all the administration and legal requirements as well. Do this by using the contact form and we will make sure that, if you are making your own way, that the road is open. A point to note is that there are no facilities provided at this excavation site and it is very exposed– so make sure you get in touch to find out what you need to bring and get information on what is expected.